Join us for a weekend of family fun and outdoor activities including a rock wall, bounce house, t-shirt decorating and more. Also show your Prairie pride by supporting our fall athletic teams during Homecoming Weekend — Go Hawks! Cookout begins at 5 p.m. Volunteers are needed to help with setup (12 – 3:30 p.m.) and to assist with activity stations – bounce houses, rock wall, t-shirt decorating and more – throughout the evening (one-hour shifts). Click here to volunteer! In conjunction with Homecoming and spirit week, students can submit their Fall-Fest themed cakes that show school spirit- GO HAWKS – and/or bring out the colors of the Fall Season in the cake contest. Entries will be judged by “Grade” and “Best Overall”. Cakes will not be judged by taste, but rather your creative designs. After the contest, you can pick-up your cake to enjoy with your family! How to register: Download the attached form and submit it with your entry by 2:30 p.m . on the day of the event (9/26) at the Welcome Desk. Note to Parents: Assistance may be provided for preparing cake and baking. Please refrain from all assistance on cake design and decorating. Let the student’s creative design emerge! Photo by Jeffrey Wilson Photography. 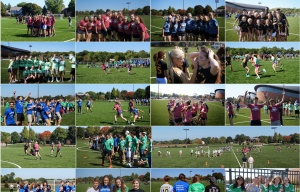 This entry was posted in All News, Athletics, Learn More About Prairie, Middle School, Primary School, Upper School by Communications Department. Bookmark the permalink.